Consultant Don McDougall Stopped his Presentation and with Consent of Cooley Turned and Attempted to Threaten Libi and Judy. On Monday, August 8, 2018, the Beaumont Finance and Audit Committee was shut down before the Committee could approve the third version of the 2017 Audited Financial Statements as required by S.E.C. Laws. Mayor Nancy Carroll and Committee Chair Steve Cooley tried to ‘blame’ Judy and I, but the video clearly shows McDougall stop his presentation and with PERMISSION from Cooley turns from the podium and directly addresses Judy and I.
Beaumont has forged their Capital Assets. Vanesa Burke forged the Financial Statements while working under Urban Futures then started working with the Pun Group to Audit the Financial Statement she spent two years forging. Donald Bruce McDougall was paraded as the City’s Consultant that forged the Capital Asset Report. 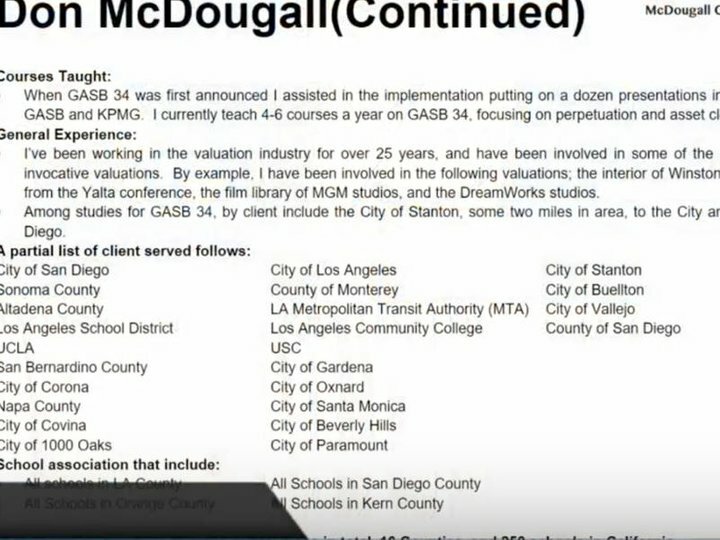 Pictured above is McDougll’s resume with his list of clients that include ‘the County of Altadena’ and ‘1,000 Oaks’. McDougal’s ‘corporate headquarters’ registered with the Secretary of State is a two-bedroom house in Camarillo. 1:30:00 Chair Steve Cooley: Presentation of the Governmental Capital Asset Inventory and Valuation Report with GASB 34. We’ve been asked to Receive and File. Beaumont Finance Director Melana Taylor: In the room this evening is the Consultant that came in and did components of the evaluation of the assets in order to have the correct values so we can have them included on our audited financial statements. He’s here tonight to talk about the basis evaluation, how it was determined, and how it all comes together for the audit. So I’m going to present to you Don McDougall and his presentation. If you have questions we’ll be glad to answer them. 1:31:00 Libi Uremovic: I don’t have a copy. Judy Bingham: I don’t have a copy. Libi: There’s no copies; you all [pointing to Committee Members] don’t have a copy either? Mayor Nancy Carroll: It’s on the screen. Don McDougall: It’s on the screen. I want to start with something off-topic for a second. I don’t know these people. This is the first time I’ve met Ms. Burke and stuff. My job here is to bring you inline with GASB 34 Compliance. The rate construction of the assets, the cleanup of your existing database, and to bring you into compliance with GASB requirements. As I’m presenting this report more fully in compliance in the meantime. Everything that needs to be done everything has been documented. Additionally; it’s been valued and completed in compliance with the GASB 34 approved ethics and guidelines. 1:32:00 Cooley: It’s inappropriate to interrupt or be rude to our guest. McDougall: [Speaking to Libi and Judy] Do you understand the concepts of liable and slander? Libi: Yes I do. Do you understand the concept of fraud and forging government documents? McDougall: So does my corporate counsel. Cooley: I’m going to recess. [Screen goes blank. What isn’t shown is McDougal, Taylor, Carroll, and Cooley crowding around Libi and Judy trying to intimidate them. Cooley: We’re going back on records and we’re canceling the meeting which is impossible to continue conducting the meeting because of the obstruction by guests who refuse to allow our guest or our committee to function. With that; the meeting ended at 7:37 pm.